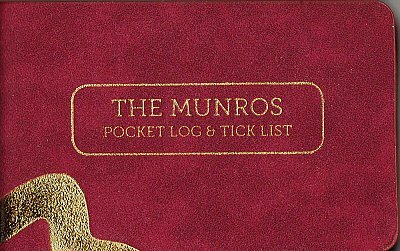 The Munros Pocket Log is a very small and classy note book which has been carefully crafted for Munro-Baggers. The texture of the cover and the gold trimmings give it a stylish retro feel. The contents are in black & white, with the hills arranged logically and geographically. Its size is its charm but also its advantage. Full size log books expect a lot more to be written than is helpful to most people, take up space and can't be easily carried. Wall charts don't allow for notes and aren't mobile either. Smartphone apps are efficient but, well, it's not the same is it?... So this is it! All you need to carry with you above 3000 feet.